With over 30 years experience we have curated a collection of exclusive packages to offer to Fiordland Helicopter clients. All packages are for exclusive use of a helicopter and pilot and are combined with an exclusive selection of incomparable Fiordland experiences. Our staff can also arrange personal itineraries, luxury accommodation and gourmet meals – just ask us at time of booking. Experience a full or half day trout fishing adventure on the Waiau River, one of the most pristine and remote rivers in Fiordland. Unforgettable! Treat yourself to a highly personal Milford Track guided journey. Includes scenic helicopter flights, private water taxi and your own private guide. Great for groups! 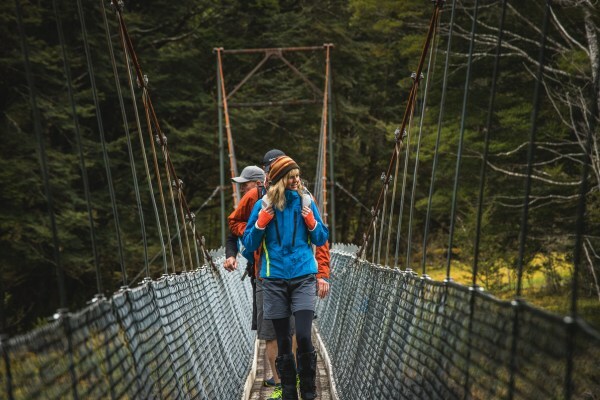 An exclusive, guided hike on one of NZ's Great Walks departing from Te Anau or Queenstown. Includes helicopter flight and gourmet lunch. This exclusive full day trip gives you the best of both worlds - see the alluring beauty Milford Sound has to offer by both air and road. An exclusive tour which takes in parts of Fiordland, few get to visit. Experience flying over NZ's iconic Milford Sound and land on a glacier. Experience the scenery of Doubtful Sound by helicopter and then up close in a kayak on this exclusive guided tour. Includes gourmet lunch. Enjoy a private Milford Sound cruise in our modern vessel with an exhilarating helicopter tour and glacier landing. A great half day experience. Fish in crystal clear water in a Jurassic setting. Enjoy exclusive helicopter use, remote fishing locations and an expert guide. A unique guided experience, enjoy a scenic helicopter flight and a hike through a NZ high country farm. Includes gourmet lunch. A unique tour, this sensational day includes a Milford Sound helicopter tour and a personal wine tasting at 2 vineyards. Lunch included. Go deep into Fiordland and land on Mt Titiroa. Then enjoy a mountain bike adventure you will never forget! All abilities welcome.